The 69th Primetime Emmy Awards take place on Sunday 17th September, and it looks to be an exciting evening for those with a nose for exemplary television shows. HBO’s major winner from last year, Game of Thrones, will lose its crown as its long hiatus means it did not make the cut this time. 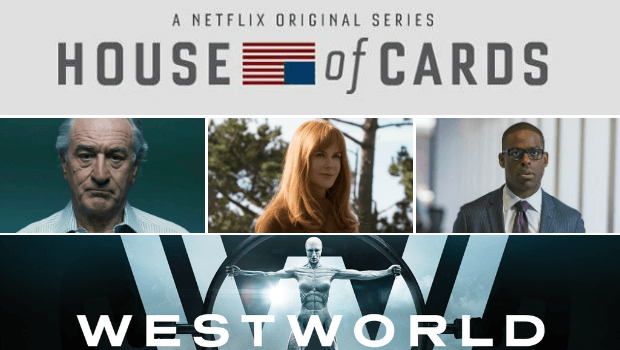 In its place, HBO has Westworld, although there may be a showdown at high noon with streaming service Netflix, who enters the Emmy fray with a series of shows including fan favourite Stranger Things, presidential drama House of Cards, and British-based regal delight The Crown! Browsing the top betting sites offering odds on specials markets like this year's Emmy Awards, punters will find most of the same shows and stars listed as favourites and long shots. Fortunately, this in-depth betting preview helps break down who/what is actually worth backing! The last year has seen a number of new shows immediately become cult classics. The smart money is on '80s nostalgic sci-fi horror Stranger Things, created by the Duffer Brothers for Netflix. Bookmaker William Hill currently has it sitting favourite at 2/1. However, it has some stiff competition in Hulu’s adaptation of Margaret Atwood’s dystopian novel The Handmaid’s Tale. Drawing eerie parallels with modern society, the show stars Elisabeth Moss from Mad Men, Yvonne Strahovski, and Alexis Bledel, and has odds of 9/4 at William Hill. Netflix also have The Crown, Peter Morgan’s ambitious biography of Queen Elizabeth II, in the running, which will run for six seasons and cover her entire adult life. Claire Foy and Matt Smith star in the first season, which William Hill had given odds of 7/2. Veep recently announced it would be coming to a close with a seventh and final season, but that hasn't stopped Armando Iannucci’s show from racking up more Emmy nominations. The past winner is favourite to win at 4/6, but the voters may decide to let it go to one of the new entrants. Top of the newbies list is Atlanta, created by and starring Donald Glover. The darkly funny show follows two cousins as they rise through the Atlanta rap scene, and its critical praise means William Hill has placed it at 9/4. Two returning shows, Master of None and Black-ish, are outsiders with odds of 14/1 and 16/1 respectively. HBO leads the nominations for the limited series or mini-series category with David E. Kelley’s dark comedy drama Big Little Lies. Starring big names including Nicole Kidman, Reese Witherspoon, and Alexander Skarsgård, William Hill is offering odds of 4/7. However, the network may be its own biggest competition with ultra-serious crime drama The Night Of. Starring British actor Riz Ahmed, it won praise not only for its riveting crime story, but its portrayal of a broken American justice system. The tough subject matter makes it a strong contender, and at 5/1 it’s a solid bet. In an odd turn of events, there is little overlap between the drama category and the actors in those shows. Instead, leading the pack of actors is Sterling K. Brown for This Is Us. The actor won last year’s Emmy Award for Supporting Actor in a Limited Series for The People v. O. J. Simpson: American Crime Story. Bookmaker William Hill thinks he will walk away with this year's award for lead actor, with odds of 8/13. His co-star, Milo Ventimiglia, is an outside shot at 20/1, but it may well go to Anthony Hopkins for his enigmatic turn in Westworld, attracting odds of 8/1. Another outside is Live Schreiber at 25/1 for his role as Ray Donovan. With bigger budgets and talent, TV is attracting big name stars, and Nicole Kidman is at the top of the list for lead actress following her performance in Big Little Lies with odds of 1/2. Her co-star Reese Witherspoon is an outside bet at 20/1, but in between there are some Hollywood legends including Jessica Lange and Susan Sarandon. These stars were both nominated for their roles in Ryan Murphy’s anthology series Feud. Out of the two, William Hill have Lange pegged as the favourite for her role as Joan Crawford, with odds of 10/3. Sarandon's turn as Crawford's rival Bette Davis has earned her odds of 11/2. With the possible exception of Anthony Hopkins, Robert DeNiro is arguably the biggest name on this year’s Emmy awards list for his role in The Wizard of Lies. William Hill are betting that his reputation alone will seal the award, but his powerful performance means you can only get even odds. A better opportunity might be Riz Ahmed. Another British name on the list is Ewan McGregor, whose double-duty performance as a pair of twins on season three of Fargo has earned him a nomination. At 16/1, the former Jedi could still have the force with him. So if you know your TV drama and comedy and want to bet for your favourite show, why not visit William Hill today! ?